I have noticed a growing trend in fitness. Rather than taking Spin classes or training to run marathons, or even heavy weight lifting, many adults are starting to pay to play. They are buying gym memberships or punch cards for classes that offer an hour of having fun! Many classes that incorporate dance, parkour, or toys like hula hoops or trampolines, are starting to become very popular all over the United States. Zumba: This Adult Fitness class features easy-to-follow routines of interval training sessions where fast and slow Latin rhythms and resistance training are combined to tone and sculpt your body while burning fat. Add some Latin flavor and international zest into the mix and you’ve got a Zumba class! HoopDance: This fun, low impact Adult Fitness class will tone the entire body while using a hula hoop on and off the body. 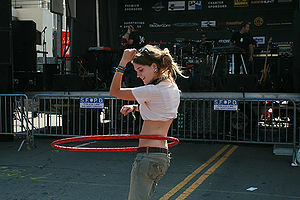 You will explore dancing while hooping and linking moves together to create a feeling a flow. This class will build coordination, body awareness, and is great for any fitness level. You laugh and smile while learning a new skill and burning calories. AIRobics, or trampolining: AIRobics is low impact fat burning exercise that improves balance and coordination and it is fun and energizing! The workout consists of moves from many different workout activities, and it incorporates some moves that can only be done on a trampoline. For men, there are also options: rock climbing has been around in the U.S. since the mid to late 70s, and gyms geared towards those athletes opened up soon after. More recently sports like Parkour or Freerunning are also being offered in gym or class settings. Interestingly, at least anecdotally it seems that women are more likely to try these “manly” sports in the safe confines of a gym and with a coach’s guidance. Adult recreational sports are also gaining popularity, from rugby and soccer to even roller derby. Why the sudden increase in playful classes and gym offerings? I suspect it’s because we adults are super stressed out (according to the American Psychological Association, Three quarters of Americans experience physical and psychological symptoms related to stress in a given month) and don’t get enough time to play and relax, but know we need to workout and at least attempt to stay healthy. Rather than do the traditional workout activities like running or lifting weights, which some find relaxing while others just find it tedious or stressful or even painful, I think many adults figure if they’re going to devote what little time they have to working out, it might as well be FUN! What are your thoughts, experiences, attitudes towards fitness? Have you discovered other fun sports teams or classes that people wouldn’t usually think of as fitness-focused?